One could quantify specs no 3 if he/she wishes. Here we emphasize on 1,2 so can leave 3 as is. The steps forH∞ synthesis are described below. Notice that we have replaced the integrator with very low frequency pole. 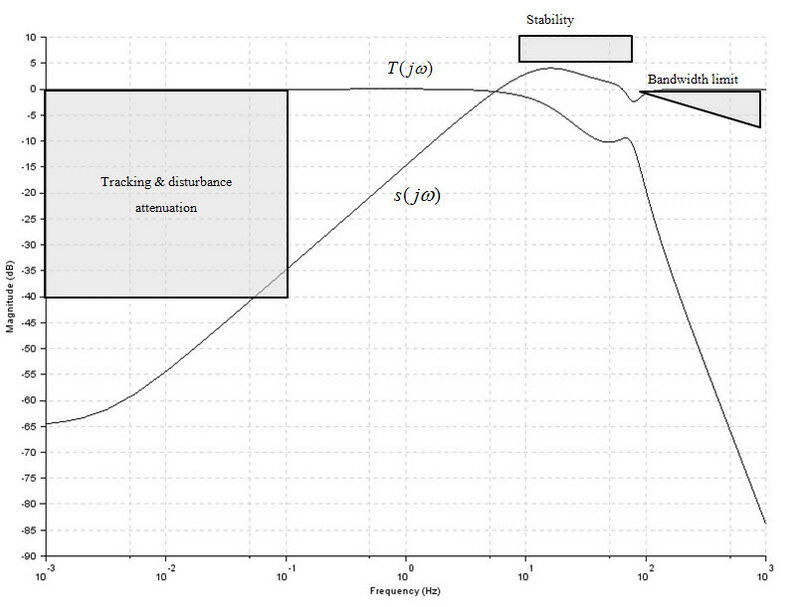 This helps fix some numerical problem when forming closed-loop transfer functions and plotting frequency responses. with their inverses shown in Figure 2, where the constraints from the 3 specifications are also imposed. Notice that the commands appear messy, because we want to adjust the matrix sizes of generalized plant automatically instead of hard-codin, in case a higher order weight is used, say. Another point worth mentioning isH∞ routines require that matrix D12 has full rank. So we need to trick them by contaminating the D12 part of Dp with a small value such as 0.001. Failing to do this and the routine will abort with error message saying D12 is not full rank. Design tips: Never forget to Replace integrator with low-frequency pole (or more generally, shift any pole on jω axis slightly towards the left half plane) and put small values to D12 and/or D21 to avoid headache withH∞ synthesis. where A,B,C,D are state-space matrices of the generalized plant, ncon = number of control inputs (1 for SISO), nmeas = number of measurements (1 for SISO), and gamma is theH∞ norm for the design. Ideally we want to have gamma = 1, but if that is not admissable we need to relax it to greater value. These commands are good at complaining, especially for a difficult plant such as in our example. It’s common to see Scilab flooded with warning messages even at the end we get a working controller. The simple hinf command is less verbose. It prefers to die with unintelligible messge (like error code = 2. What the heck that means is beyond me). A stable closed-loop system must have all eigenvalues with negative real part. If it is not stable, it might be because too much performance is asked. Try relaxing gamma to higher value, or adjusting the weighting function(s) and rerun the synthesis. 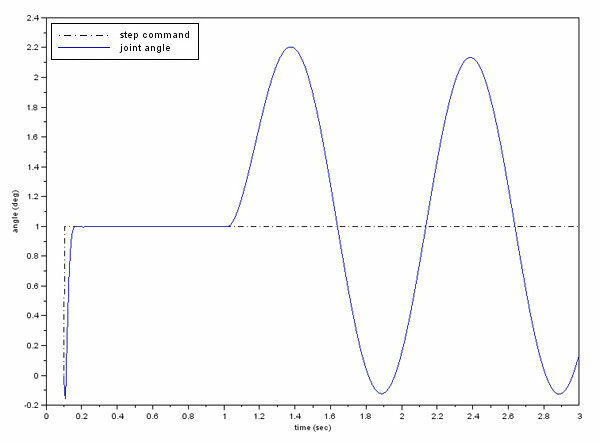 Only when you get a stable closed-loop should you plot the frequency responses of S and T. Otherwise you may find yourself looking through a meaningless plot and trying to interpret it. 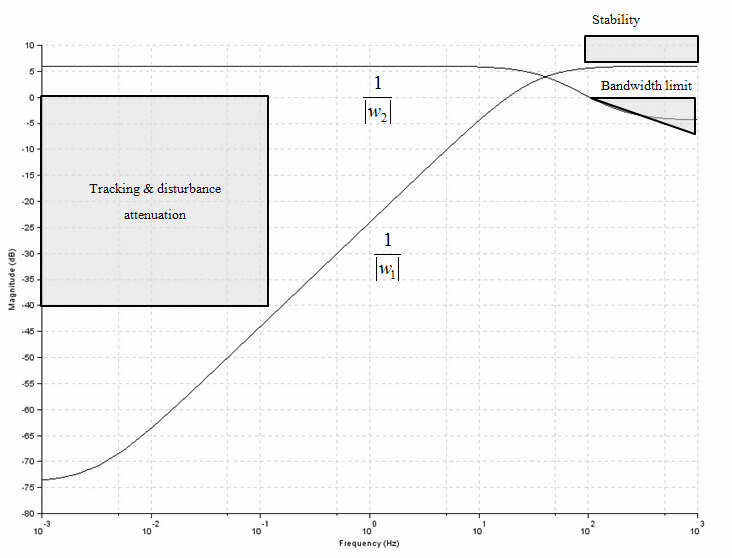 Use the gainplot command since we don’t need the phase of S and T.
This results in the frequency response plot in Figure 3, together with the criteria from 3 specifications. We can see that tracking performance region is slightly violated at the corner, but the oveall seems okay. The last checklist is to simulate a time response. Construct an Xcos model like in Figure 4 and set up suitable simulation parameters. First we test only angle response to step command by turning off the torque disturbance signal. The result in Figure 5 looks quite nice. 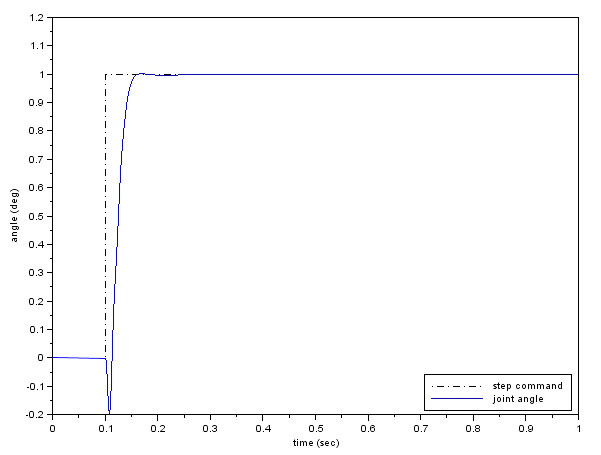 The rise time is less than 0.05 sec with no overshoot and unnoticable steady-state error. The undershoot at start time is common for a non-minimum phase plant. However, when the disturbance d(t) = 0.001sin(2πt) is turned on at t = 1 sec, the response in Figure 6 indicates poor disturbance attenuation. The magnitude swing due to disturbance at output is 1.2, or more than 1000 times of d! To summarize, in this part of ourH∞ trilogy we give a concrete example on how to synthesize a controller for tracking problem using Scilab. The resultingH∞ stabilizes the closed-loop system and yields satisfactory tracking performance. While all specifications are met, the feedback system is susceptble to disturbance at torque input, with significant disturbance amplification at plant output. Since the track command and disturbance has spectrum in low-frequency region, you may believe that by pushing the magnitude of S lower in low-frequency, that should improve disturbance attenuation performance. That is a valid statement indeed. This sensitivity minimization is not trivial, unfortunately. The so-called “waterbed effect” dictates that the more you push low-frequency region of S, the more area it consumes above 0 dB line in high-frequency. When bandwidth is limited this results in high peak of S that affects stability. This effect is even worse for non-minimum phase plant, of course. To see this by yourself, try using higher order weighing function for w1 to push magnitude of S down as much as you could in low-frequency. Email me if you can get a controller that could significantly improve disturbance attenuation performance. Torque disturbance attenuation at point x in Figure 1 is a major issue in independent joint control of robot arms, since the disturbance signal d represents the force/torque exerted from adjacent joints. In the last episode of thisH∞ synthesis series, we will analyze this problem further and suggest a control structure that could better handle this demanding task. sk.dat Example of controller data for simulation (in case you fail to synthesize one and want to run the above Xcos model. Type load(‘sk.dat’) to load data into Scilab workspace.